Perched above the rushing Seine River in Paris, France I couldn’t believe I was finally doing it – photographing Paris! After a day of scouting, baguettes, cheese, and wine tasting I was ready for sunset. With massive flooding along the scene, it was the perfect opportunity to capture a wider shot of Notre Dame and the iconic Parisian architecture that is present all over the city. Patiently waiting for the lights to illuminate the buildings, I prayed the sunset would hold out long enough to capture both. 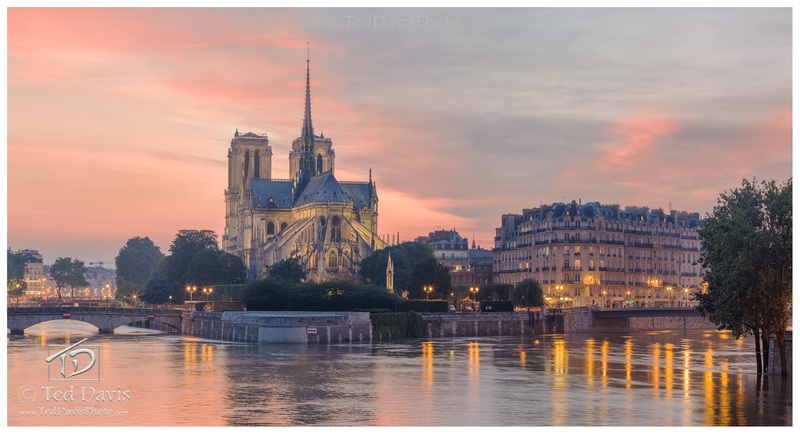 As my hopes dwindled to nothing, the building lights suddenly popped on and I clicked down the shutter – capturing a long exposure of Notre Dame with the fading light of sunset above the Cathedral. Photo © copyright by Ted Davis.